Israeli authorities temporarily raised the alert level for border towns near Gaza following attacks that damaged a car and a restaurant. It was an open miracle, residents said. 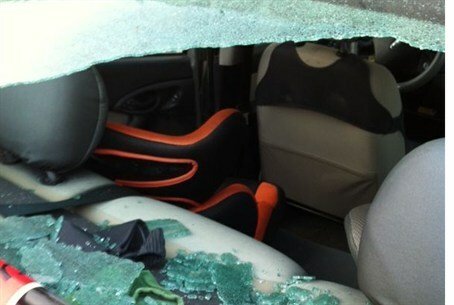 A Palestinian Authority Arab sniper aimed at the junction to Kibbutz Yad Mordechai on Monday evening, and scored a direct hit into the back windshield of a car, pumping bullets into the back of the vehicle. At least one went dead center into the back of a baby's car seat. But the seat's 7-month-old occupant miraculously wasn't there. According to the IDF Spokesperson, a total of 10 bullets were fired at the vehicle. Israeli authorities temporarily raised the alert level for border towns near Gaza following the attack, which also damaged the wall of the restaurant located at the junction, but the level was returned to normal after soldiers patrolled the area, the IDF Spokesperson said. The sniper fire came as part of a spate of terror attacks aimed at southern Israel on Monday. Earlier in the day, an anti-tank missile was fired at a group of Israeli farmers working near the security fence in the Eshkol district, along the border across from Khan Younis. No one was physically wounded, although several people suffered trauma symptoms. Later in the evening, PA Arab terrorists in Gaza launched a rocket attack on the Israeli coastal region. A short-range Qassam rocket exploded in the Ashkelon Coast Regional Council district. As in the prior attacks, no one was physically injured, but numerous people suffered anxiety, and symptoms were triggered in those with post-traumatic stress disorder (PTSD). Numerous research studies have shown that the majority of residents living in southern Israel, including the children, are suffering from trauma-related conditions as a direct result of having lived under the unabated threat of terrorist rocket fire for so long.